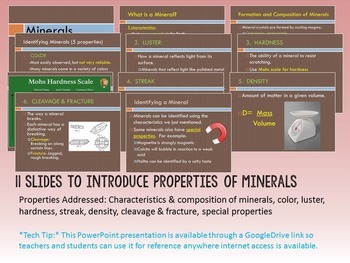 This lesson uses PowerPoint, worksheets and engaging activities to help your students learn about characteristics, special properties and examples of minerals including color, luster, crystal formation, density, hardness, streak, and cleavage or fracture. My environmental science lessons are designed to facilitate independent learning and are ideal for sub plans or simply to encourage self-instruction of basic concepts. 2. 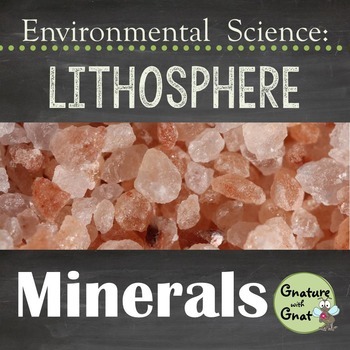 Activity- Students practice using mineral properties by identifying up to 20 minerals. 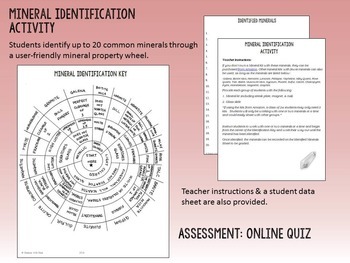 A user-friendly identification wheel is provided which provides quicker identification than traditional mineral charts. 3. Teacher instructions and materials list for the activity. 4. Student data sheet to record minerals after identification. 5. Assessment- Online quiz for evaluation of concepts learned. 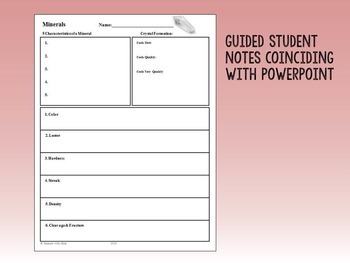 These lessons are designed to be easy to use for both students and teachers. Regardless of whether you've taught Earth Science or Environmental Science for years or just need a few quick lessons to add to your science curriculum, this is the perfect selection. Check out my blog for more science tips, tricks, labs, and news!